Jean Charest's political gamble has paid off: Quebecers handed his Liberal party a majority Monday night. Liberal Leader Jean Charest takes the stage at his election headquarters in Sherbrooke. ((Paul Chiasson/Canadian Press))The Liberals clinched 66 seats, three more than they needed to form a majority and 18 more than they won in the last provincial election. "I want to thank Quebecers for their confidence," Charest told supporters in Sherbrooke. "We will be worthy of their confidence, and I will be a premier for all Quebecers." "I've never been so happy to be Québécois," he said. The Liberal victory came at the expense of the Action Démocratique du Québec, which is poised to take just seven seats compared with the 39 it had going into the election. Just hours after polls closed, ADQ Leader Mario Dumont conceded defeat and announced his resignation as leader. The Parti Québécois also cashed in on the ADQ's difficulties, electing 51 candidates, more than enough to form the province's Official Opposition. The premier, holding a minority in the legislature, called a snap election this fall, seeking a "stronger" political mandate to counteract the economic downturn and trying to capitalize on a weakened opposition. Voters answered Charest's call, backing the Liberals in greater numbers than the Parti Québécois and the ADQ, and giving him a historic third mandate. No premier has won three consecutive mandates since Maurice Duplessis of the defunct Union Nationale, who served a total of five terms as premier — from 1936 to 1939 and again from 1944 to 1959 — the last four of them consecutive. Concerns about low voter turnout and general political apathy contributed to what was regarded as a lacklustre campaign in Quebec. The race was eventually dwarfed by Ottawa's political crisis and the prospect of a Liberal-NDP coalition, backed by the Bloc Québécois, or a possible federal election. In the end, only 56.5 per cent of eligible voters cast a ballot, the lowest election turnout in the province since 1927. From the start of the Quebec campaign, Charest never strayed from his core message: The province needs a majority government for political and economic stability. Liberal supporters celebrate in Sherbrooke, Que., after the party won a majority government in Monday's provincial election. ((Ryan Remiorz/Canadian Press))Charest repeated that mantra daily throughout most of the 4½-week campaign, fending off opposition attacks on his government's record. The Liberals ran a smooth race after the Nov. 5 election call, avoiding any major faux pas. They stumbled slightly over money later in the campaign, when outgoing finance minister Monique Jérôme-Forget referred to more than $16 billion in investment projects across the province. The Journal de Montréal newspaper investigated the claims and found that several of the projects didn't exist. Charest's performance during the leaders' debate was seen as solid, despite his inability to provide a specific dollar amount for Quebec's debt. When the federal power struggle in Ottawa boiled over earlier this month, with the Liberal-NDP coalition challenging the Conservative government, Charest saw opportunity in the chaos, telling voters they don't want similar drama in their provincial legislature. 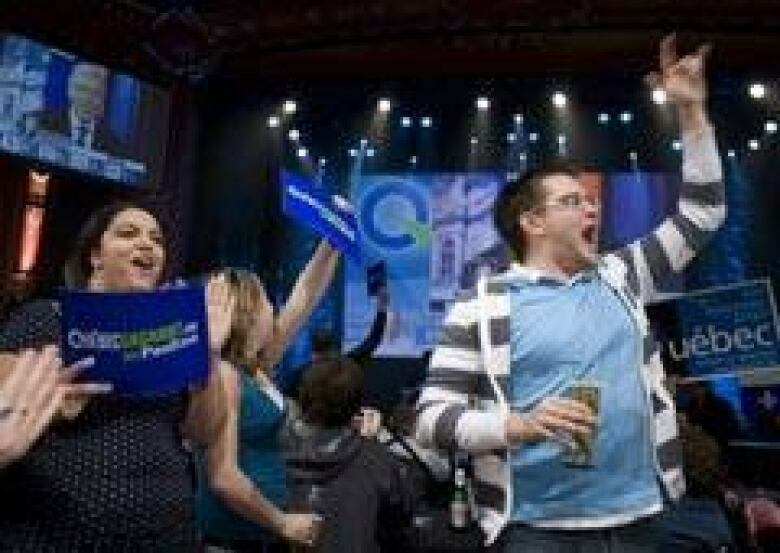 Conservative supporters fanned the flames of anti-sovereigntist sentiment and attacked the Bloc Québécois, but Charest handily deflected a potential stampede toward the Bloc's provincial cousins the PQ, defending the federal party as a legitimate entity in a democratic country. 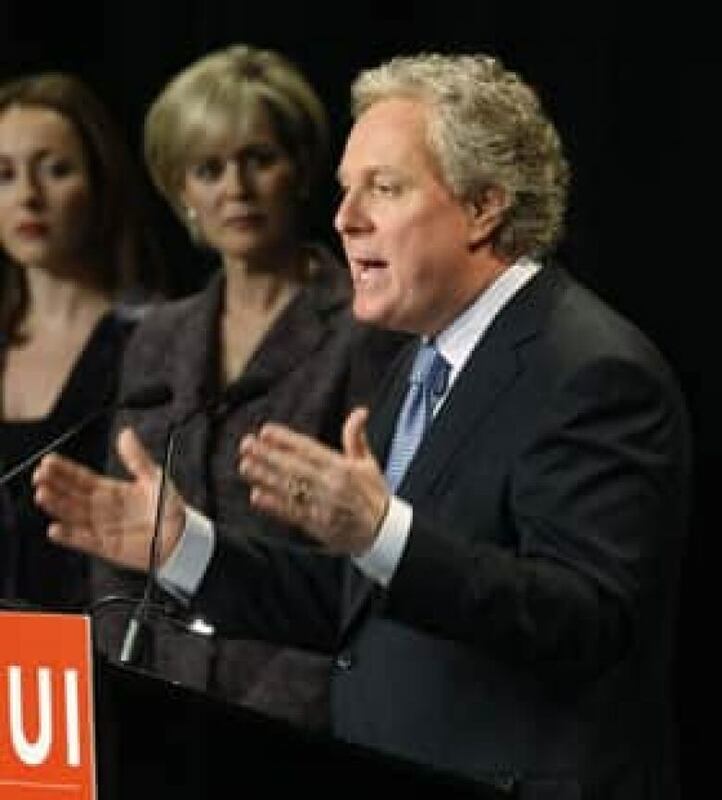 Charest brought his campaign message back on track, reminding people the "economic storm in front of us won't make any distinction between federalists, sovereigntists and any other Quebecers," which was seen to score political points among the francophone electorate. And his 11th-hour campaign appeal to sovereigntist-minded voters appeared to deliver the critical mass needed for the Quebec Liberal Party to rebuild a majority. Leader Mario Dumont, who was re-elected, resigned suddenly as head of the ADQ, after the right-wing party was trounced in Monday's provincial election. ADQ supporters listen to poll results at the party's headquarters in Rivière-du-Loup. ((Clément Allard/Canadian Press))"It's with a lot of passion that I've been serving Quebecers for 14 years," Dumont told supporters gathered at his Rivière-du-Loup headquarters, east of Quebec City. "I accept this verdict, and take responsibility for this defeat." "The time has come for me to turn the page and go back to my family," he said. The snap campaign came at a bad time for the ADQ, which was still smarting from the defection of two high-profile members to the Liberals a few weeks before the election call. Dumont struggled to capitalize on his party's stunning gains in the 2007 election, but whatever momentum he drew from those results fizzled as his caucus's relative inexperience and limited platform became increasingly clear. In this campaign, Dumont was dogged by "one-man-band" accusations. Even help on the campaign trail from his wife and party co-founder, Marie-Claude Barrette, failed to galvanize the thousands of voters who backed the ADQ a year and a half ago. Dumont apologized during the campaign for letting Quebecers down as Opposition leader. But his stunt as a blond wig-wearing boxer on a network comedy show brought questions about his judgment. The ADQ leader played up his party's education policies and commitment to improving the school system. Dumont insisted throughout the race that ADQ supporters still believed in the party and were ready to show it at the polls. The PQ "is back" party leader Pauline Marois declared at a celebratory rally in downtown Montreal. PQ supporters Rim Mohsen, left, and Guillaume Raymond celebrate as results are announced in Montreal. ((Jacques Boissinot/Canadian Press))"I promised we would help rebuild Quebec's great party," she said. "Tonight, the party is back!" she told elated supporters who chanted "Pauline, Pauline, Pauline," and "on veut un pays [we want a country]." To deafening cheers, Marois told the crowd, "This is a party that has found its groove." Marois faced her own challenges during the campaign. The first female party leader in Quebec's history, Marois broke some barriers while facing criticism within her party for her well-honed public persona. The PQ was forced to campaign with limited funds as the party was still paying for the 2007 campaign. An internal report leaked early on in the race said Marois has an image problem with voters because she seems like a snob. The PQ's infamous infighting was also on display, with a public scuffle requiring police assistance marring a candidate's nomination meeting. But Marois received high praise for her performance during the leaders' debate. Marois's vow to shelve an immediate referendum contributed in part to the lack of sovereignty talk during the campaign. When the Bloc Québécois came under fire during the federal political crisis, it was Charest more than Marois who was able to capitalize on the anti-sovereigntist rhetoric.